Ok so I've been remiss in posting our adventures. This whole blogging/foreign correspondent thing is pretty new to me. I reach the end of a day and I'm so tired I decide to write "tomorrow" but then when the sun comes up the next day (FINALLY! It is 8AM here before it is even remotely light out) then I am so eager for more adventures that still nothing it written. Well no more. So, the very first night at the new apartment in Bilthoven, outside of Utrecht, we met one of our neighbors. First let me describe the apt: there is an entrance to the stairwell fron outside; I go up one level, the apts are above a market that has a bunch of shops (bakery, pharmacy, veggies, meats, newspapers, cheese, basically everything I would need is right downstairs except the DVD-rental!). Ok, so then on the second floor it is an outdoor courtyard with all the entrances to the apts. I will take a picture soon I promise. The point is, the space is outdoor but confined. There are maybe 10 or 12 apts off the courtyard. So Joe and Carrie and I went out for a nice walk after dark, this our first night here and we were doing some little exploring before conking out completely. 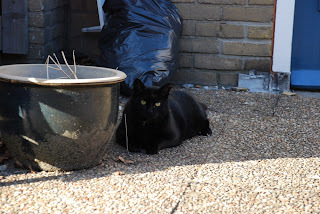 Upon returning to the courtyard, we came across a black cat. This same cat had earlier hissed at us but nothing more. I figured it was scared, after all, Joe is pretty big and Carrie is All That. The courtyard is very dark, the cat is black, I am fumbling for the keys, and all of a sudden, WHAM, HISS, YELP, SCREAM (that last one was me), and we quickly wheeled around. But not quick enough, Carrie was hit the second time around, HISS, YEEELP (really a pitiful sound), more screaming by me (yup, first night moved in, I'm the American screaming in the courtyard in the middle of the night). Now, this story with the black devil-cat was a few days ago; yesterday I took the guys to a nearby wooded area for a hike. They call it a forest but is isn't very pretty, there is not a glimmer of hill, slope, or rolling anything anywhere, and the trees are young, brushy, and there is a lot of undergrowth as if from a fire or logging. But it was nice to be away from city life so I took the dogs off their leashes to let them get a bit of exercise. Joe frolicked on the path and did his patented Happy Dance, Carrie and I ducked and enjoyed the scene. We continued walking until a forest ranger type person drove up (I had the dogs on their leashes again) and he stopped his car and got out. I knew this could not be good. He pointed at Joe and started talking in Dutch. I apologized and said I didn't understand. He repeated in English that Joe was a "Hunting dog" and was not allowed in the forest. Jeepers! Joe isn't likely to hunt much besides the nearest sofa but I did not argue with the man. Nor did I mention his recent battering by the local cat. It seemed to be okay as long as we were on the path and Joe on his leash. And Carrie he couldn't have cared less about. I saw other big dogs off leash, so it was something about Joe being a sighthound I imagine. Dogs can ride busses, subways, trains in Germany. They may also go into many restaurants in Germany, but NOT the grocery store. In the Netherlands, dogs may also go on busses but they require their own ticket! (Carrie is exempted because she is a "lap dog" yeah right!) but dogs, bikes, and kids all need their own tickets. I'm not sure yet about trains in Netherlands, but I imagine its the same. I don't think dogs go into restaurants here, at least I haven't seen any and I don't plan on trying it. Ok, now I can move on to current events in the next post! !